Isn’t is funny how sometimes the simplest recipes that come from ingredients you already have on hand can actually become family favorites? 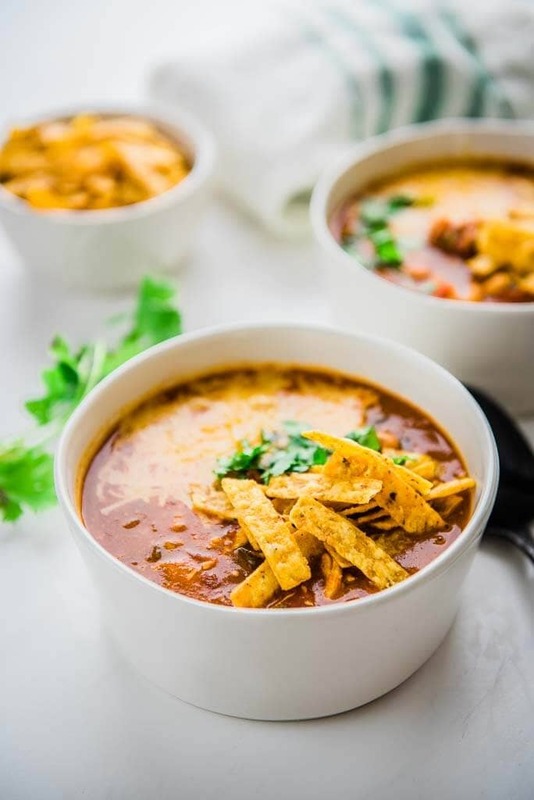 This Slow Cooker Spicy Chicken Enchilada Soup is one of those recipes sure to become a staple in your house! It seems like I never make my soups and chilis the same way twice so here I am sharing yet another version with you. I started out calling this a chili because it’s a little thicker than a soup and also had beans. But the idea and the flavors probably better fit the idea of a soup! Either way it’s super easy to throw together and you could add any number of veggies or beans to customize it. I love the nice juicy chunks of chicken and tomatoes not to mention the crunchy tortilla strips to top it all off. 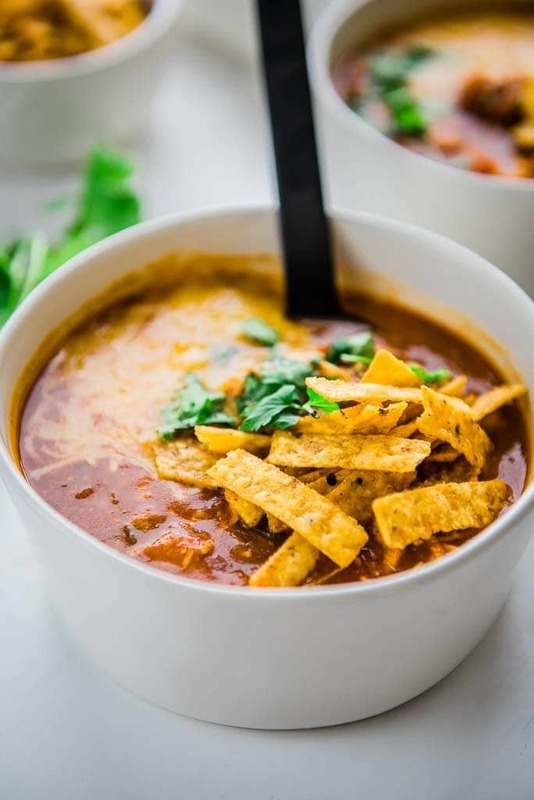 You just can’t go wrong with this Slow Cooker Spicy Chicken Enchilada Soup no matter what you call it. I always find myself coming back to these types of recipes when I’m feeling too tired to “cook” or make a big mess. It always saves us from going out to eat and they often turn out to be some of our favorite meals. 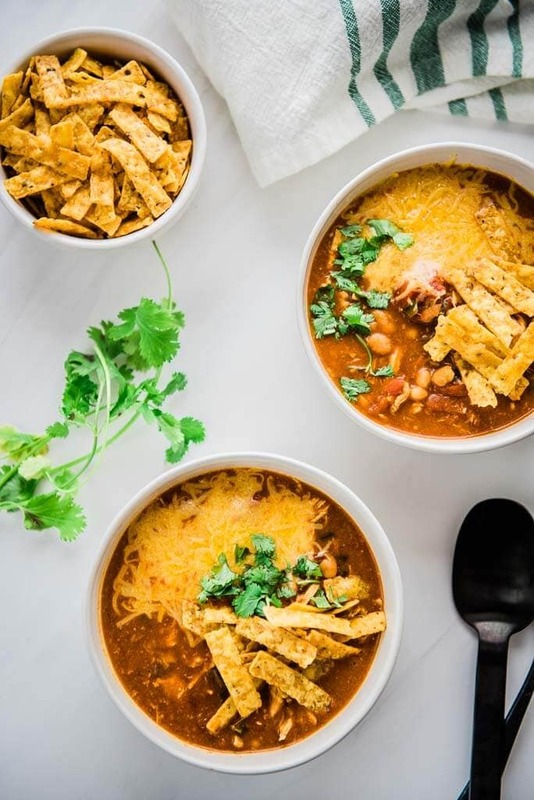 What is in enchilada soup? 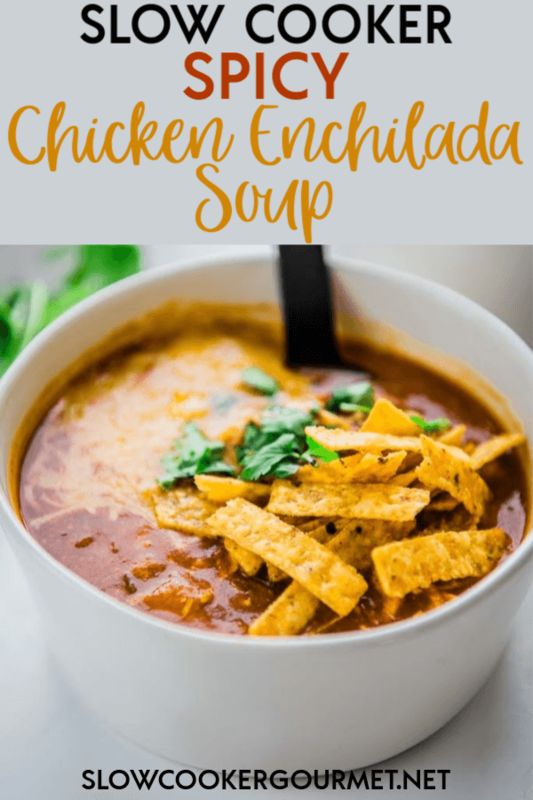 Pretty much all of the things you would expect to find in enchiladas, but just in a soup format. In this case we are going with chicken! 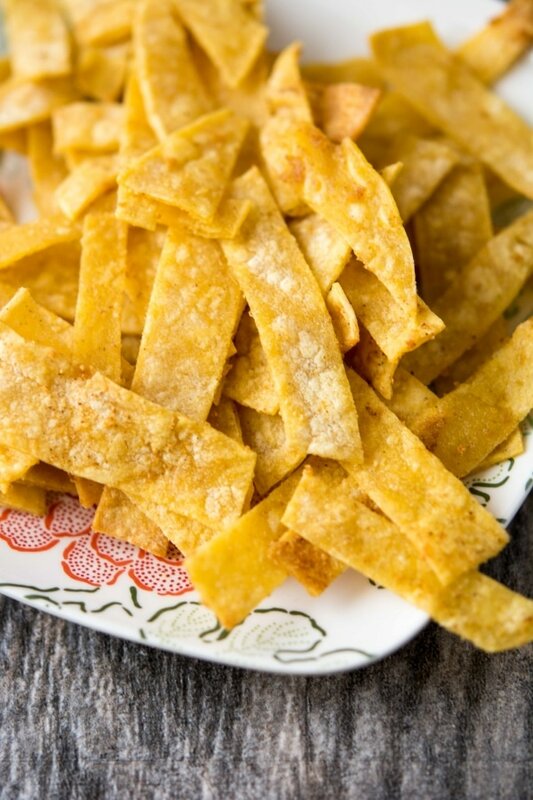 tortilla strips – homemade are great and I’ve included the recipe below. But in a pinch, I also love these. I think this is just one of the reasons I love my slow cooker so much. It lets me put together a dinner out of what we have in the fridge and pantry and still feel good about the meal I’m feeding my family. Plus…I’m pretty much a fan of anything that can be topped off with sour cream and cheese! What’s a favorite meal you’ve made for your family with stuff you’ve had on hand? What do you like to throw in the slow cooker on super busy days? Isn't is funny how sometimes the simplest recipes that come from ingredients you already have on hand can actually become family favorites? 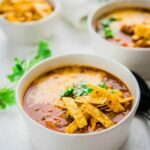 This Slow Cooker Spicy Chicken Enchilada Soup is one of those recipes sure to become a staple in your house! Thanks for letting me know. I’ll keep that in mind. I have to be careful around beans due to my Crohn’s disease. Thank you! The soup sounds wonderful! Are the 15 oz. of white beans canned? Or dried? I’m assuming canned. Your soup sounds delicious. Could you substitute garbanzo beans instead of navy beans? Thanks for letting me know. Thanks Kathryn! Yes, you can. But the texture will be different so keep in mind that the garbanzo beans may become the star of the show since they will hold their bite a bit more. My first Slow Cooker Gourmet dinner and oh my yum! Can’t wait to try more of your recipes now! Ps If you have fresh lime, offer it up for those that might want to squeeze some over the top of their bowl of chili for yet another layer of flavor. Soooooo good. Thanks Shannon! That’s awesome! And the fresh lime is a great suggestion. I will add that to the recipe notes! Hi Joann! Yes, you can totally sub this out. I would use about the same amount but you may find you need to add just a bit more since the store bought may not be quite as potent. Wow! This was so unbelievably easy to fix – and it made for a delicious, hearty meal. Instead of the white beans, we used black beans, but other than that – we followed the recipe to a tee (which we never do! ), and it was a home run for my family! Served up with some warm cornbread. Yum!! This was AWESOME!!! I got started late, so I cooked it on the stove top, browning and throwing in the chicken about 30 minutes before it was done. My entire family loved it!! Will make it again and again and share this with my friends. This is seriously one of the best and easiest things I’ve ever “made”. The only thing I ever change is I add some black beans to it, but besides that the recipe is perfect exactly the way it is! Thanks Evelyn! I’m so glad you love it!